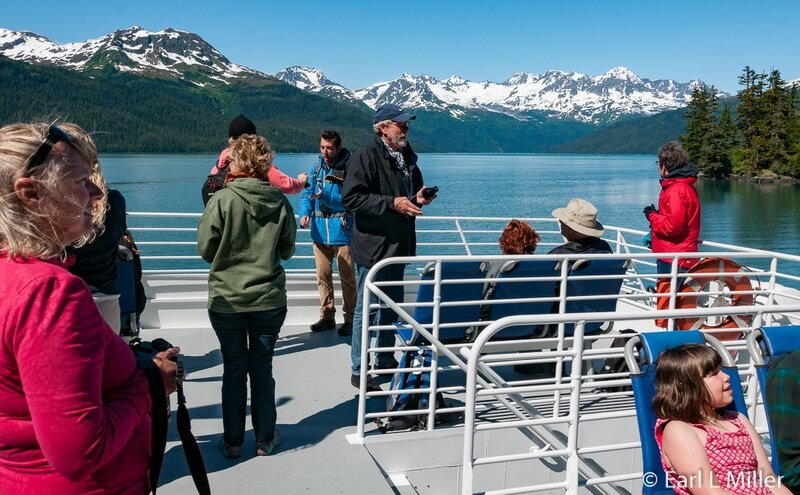 A relaxing way to combine viewing incredible Alaskan glacial scenery with center stage wildlife is to take a Stan Stephens’ cruise out of Valdez. One choice is the 8.5 hours, 120 miles, voyage to the Meares Glacier while the other is a six hours, 80 miles, trip journeying to a quarter mile from the Columbia Glacier. Stan Stephens and his wife, Mary Helen, started the company in 1971 as North Star Marine Charters. That year, they operated fishing and hunting charters on their boat, the Mary Helen. In 1978, their three daughters joined the business and the company changed its name to Stan Stephens Charters, Inc. The final name change came in 2003 with the decision to call the company Stan Stephens Glacier & Wildlife Cruises. The Stephens’ mission has been to not only develop their operations but to increase their passengers’ awareness of Prince William Sound and Valdez. Another goal came about as a result of the Exxon Valdez accident. It was then that the family dedicated their lives to protecting the Sound. They kept their promise as their vessels were among the first to carry response observers to the spill site. Stan led the company until September 2013 when he passed away. Colleen Stephens, his daughter, is now company president. The Stephens have always taken special care to make sure their passengers have an enjoyable trip. They staff their boats with Alaskans, who are qualified and eager to answer questions rather than employing seasonal staff. Most of their captains, who narrate from the wheelhouse, either grew up in Valdez or have been in the area for many years. 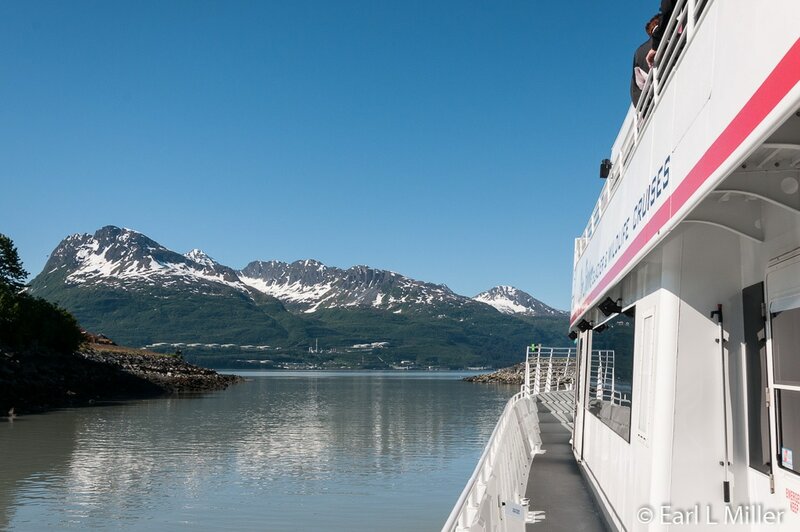 On both excursions, passengers learn about Valdez history and local lore. Captains make sure that travelers return to port with a knowledge about the early explorers, gold and copper mining, oil shipping, commercial fishing, the 1964 earthquake, and the Exxon Valdez accident. Neither boat is crowded. 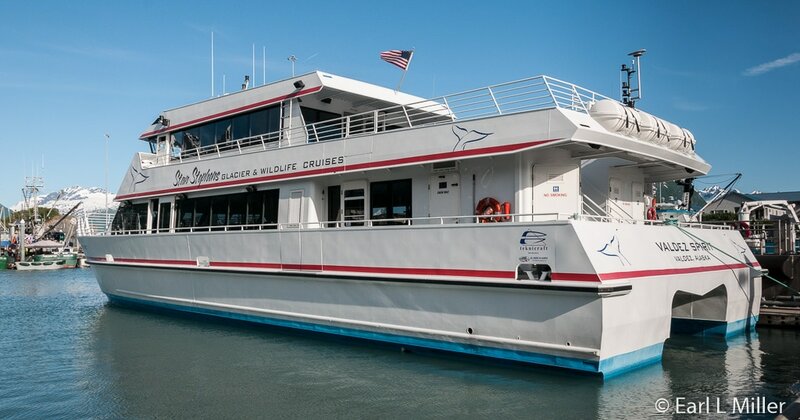 The Meares cruise takes place on an 82-foot aluminum catamaran, built by All American Marine, which can accommodate 150 passengers. However, bookings are held to 130. The Columbia Glacier cruise in 2017 will be on a new boat.. It will be a 90 foot catamaran built this winter in La Conner, Washington at Mavrik Marine. Like its sister ship, it will be able to handle 150 passengers but bookings will be held to 130. This allows for plenty of room to walk around and photograph without finding the crowding found on other lines. Both boats are smoke free. Both excursions provide multiple opportunities to view wildlife up close. On a given day, you’re very likely to see otters, harbor seals, Orcas, humpback whales, and Steller sea lions. Bird life is abundant, too, with everything from puffins to cormorants, kittiwakes, and bald eagles. There are differences between the two excursions besides voyage lengths and mileage covered. One is the fare. The Meares Glacier excursion, leaving at 10:00 a.m., is $165 for adults and $82 for children. 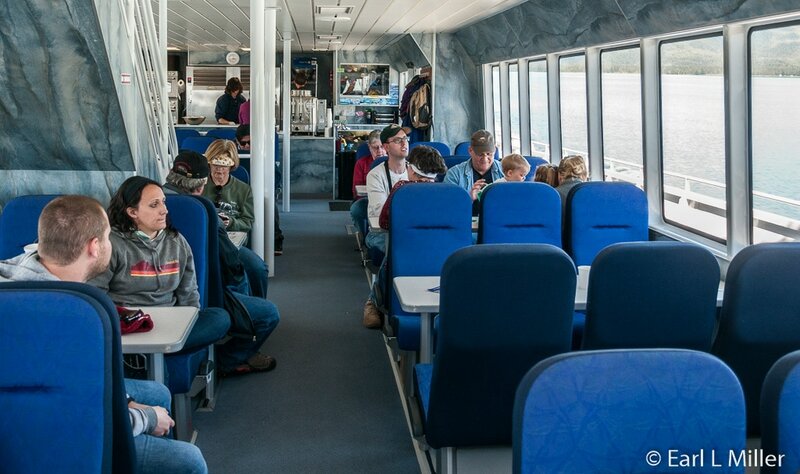 The shorter Columbia Glacial cruise, departing at 11:00 a.m., has fares of $132 for adults and $66 for children. Children ages two or under can travel for free on either. The Meares Glacier cruise runs between June 1 and August 31 while the Columbia Glacier trip occurs between May 16 and September 13. Another difference is what you are served on board. You won’t go hungry on either. On the Meares Glacier cruise, guests are served a lunch of chicken Alfredo with rice and steamed vegetables. They receive an afternoon snack of clam chowder and crackers. Those seeking vegetarian food will find that option available. The meal on the Columbia Cruise consists of a bowl of clam chowder, a bagel, cream cheese, and cookies. Complimentary tea, lemonade, and water are served throughout the day on both with hot chocolate and apple cider available for 75 cents. Some special food requested when booking can be accommodated while others cannot. For example, passengers can order minestrone soup instead of clam chowder. What glaciers you see and how close you get to them differs on the two excursions. While most glaciers throughout the world are retreating, the Meares Glacier is an advancing glacier which means that it is adding ice. On the Meares excursion, Valdez Spirit will come close to the glacier’s face and spend about an hour there. You’ll also pass the Columbia Glacier but at a distance since your boat doesn’t enter Columbia Bay. The Columbia Glacier is the largest tidewater glacier in Prince William Sound and the second largest in North America. It is rapidly receding. 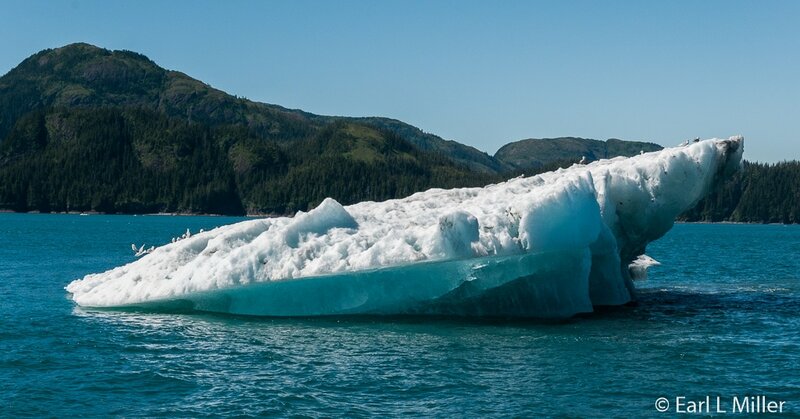 On the Columbia Glacier excursion, you will see icebergs from this glacier while touring Columbia Bay then travel to a quarter mile from its face. On either excursion, it is wise to dress warmly and in layers since it’s in the mid 40's when you are next to the glaciers. Be sure to bring binoculars, cameras, film, or extra memory cards. Since we had the whole day, we decided to take the Meares Glacier excursion. 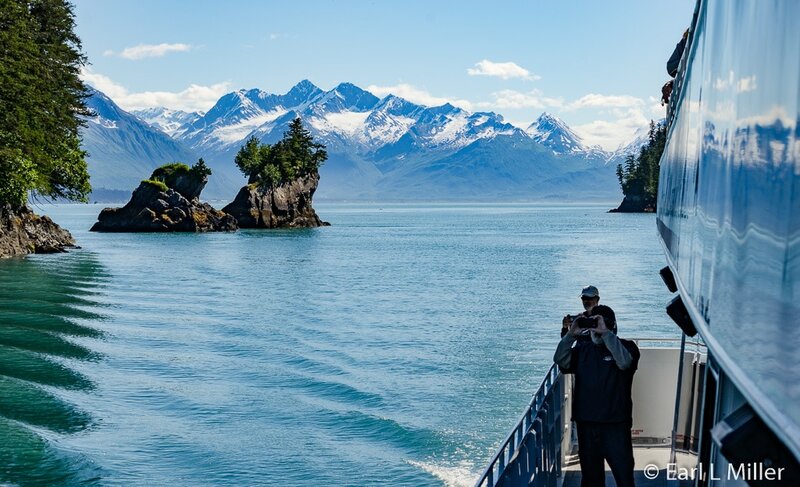 We immediately found Stan Stephens cruises to be a well-run operation with quality staff, an excellent captain, and a concentration on both glaciers and wildlife. The captain attempted to get close to the wildlife and stay for an extended period. The boat was turned in a 360-degree circle when wildlife was spotted so everyone could view the animals. This allowed for quality photography. Amanda Bauer, our captain, provided extensive narration. She invited people to come upstairs and ask her questions. She has worked at Stan Stephens cruises since 1995 when she arrived at Valdez from Independence, Missouri. Our boat, Valdez Spirit, had two decks, both with outside areas. Passengers could stay up front on the lower deck or stand in its rear on the second deck. There was also room on both sides of the ship to go outside to photograph. The upholstered seats were very comfortable, and the ship felt roomy. The Valdez Spirit was built in Bellingham, Washington in 2004. Each of its engines is 800 horsepower making this propeller driven catamaran capable of cruising 20 knots. A tiny gift shop offers a few souvenirs. For those who forget their own binoculars, one can be rented at $5 for the day. A counter of general reference books, on such subjects as Alaska and its wildlife, is supplied downstairs for passengers to peruse. A nautical chart, to see where you are going, is in front of the galley. 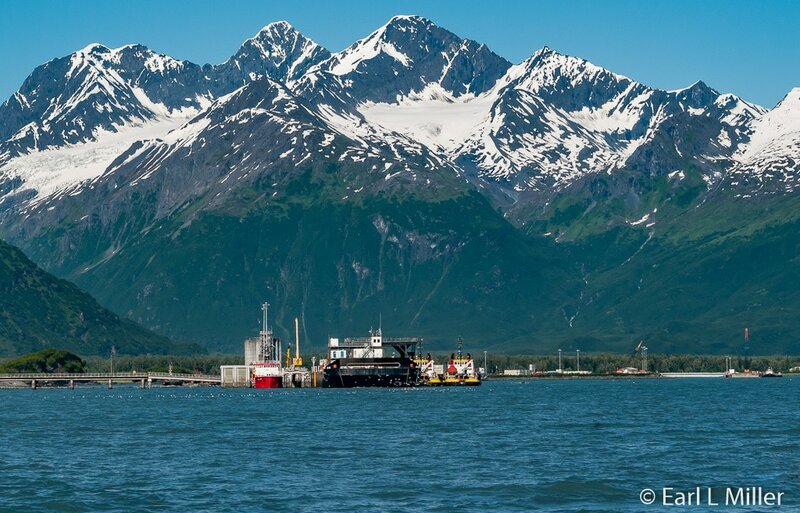 Shortly after the Valdez Spirit departed at 10:00 a.m., she passed the new boat harbor of the Port of Valdez. Amanda took that time to talk about explorers and Gold Rush prospectors. Historically, the territory south of Valdez belonged to the Chugah Eskimos, a maritime hunting people, while the Ahytna, an Athabascan people, occupied the land to the north. They used the area for fishing and trading. Captain Cook, in 1778, was the first non native visitor to Prince William Sound. He originally called it Sandwich Sound after the Earl of Sandwich. Upon his return to England, his map editors renamed it after Prince William IV. Russian and Spanish involvement came next. Fidalgo’s exploratory party, led by two natives, was the first to approach Columbia Glacier. They didn’t stay long since they believed it was an active volcano because of the calving. It was also Fidalgo who named the area’s “Bay of Valdez” after Spanish admiral Antonio Valdes. Valdes was head of the Spanish marines and the Minister of the Indies at the time. It was George Vancouver, who had previously sailed with Cook, who accomplished the Sound’s most extensive exploration. The Russians, during their ownership of Alaska, were primarily interested in sea otter pelts rather than discovery. Gold seekers came during 1897-1898 to Valdez to follow the “All American” route over the Valdez Glacier into the interior. When 4,000 stampeders came through, many died in their attempts. Sometimes goods had to be carried on as many as 20 trips over the journey’s steepest parts. Scurvy, snow slides, snow blindness, glacial crevasses, and other challenges provided major hardships. Their route had been described by U.S. Army Lieutenant William Abercrombie, who had never crossed the trail. By the fall and winter of 1898, Abercrombie’s men cut a rough trail through Keystone Canyon and Thompson Pass. The U.S. Army improved the trail the next year and built Fort Liscum after recognizing Valdez as a strategic location for communications and defense. After the Klondike Gold Rush ended, prospectors concentrated on the gold, copper, and silver deposits of Prince William Sound. Gold mining in the Sound began with the discovery of Cliff Mine, adjacent to Shoup Bay. It produced close to 52,000 ounces of gold and was the Sound’s richest gold mine. The Kennecott Mines, near McCarthy, owned by the Morgan-Guggenheim Alaska Syndicate, produced more copper than all of the other mines combined. Amanda then spoke about how the 1964 earthquake, which registered at 9.2 in magnitude, struck 43 miles west of Valdez. The quake and its tsunamis destroyed Old Town Valdez killing 32 people. The town was condemned when it was discovered the entire area had been built on unstable ground. Everyone moved to a new community four miles away in 1967. Today only a few signs remind travelers that a town once existed at the former site. As Valdez Spirit passed the Alyeska oil terminal, Amanda told us about the Trans-Alaska Pipeline Project. At one time, tours were given of this terminal. This ended with the September 11, 2001 tragedy, and now security is very tight. Valdez was selected as the oil terminus since the port is naturally deep. It’s 800 feet in the middle and no dredging is required. It’s also Alaska’s most northern, non freezing port. It took three years to construct the pipeline, and at $8 billion, it was the most expensive private project of its day. In the beginning, 19 tankers a day docked at the terminal. Traffic peaked in the late 1980's. Today, only three tankers a day visit. Amanda advised that the project has been more successful than expected, and in its 40 years, 70 million barrels of oil have left on tankers. 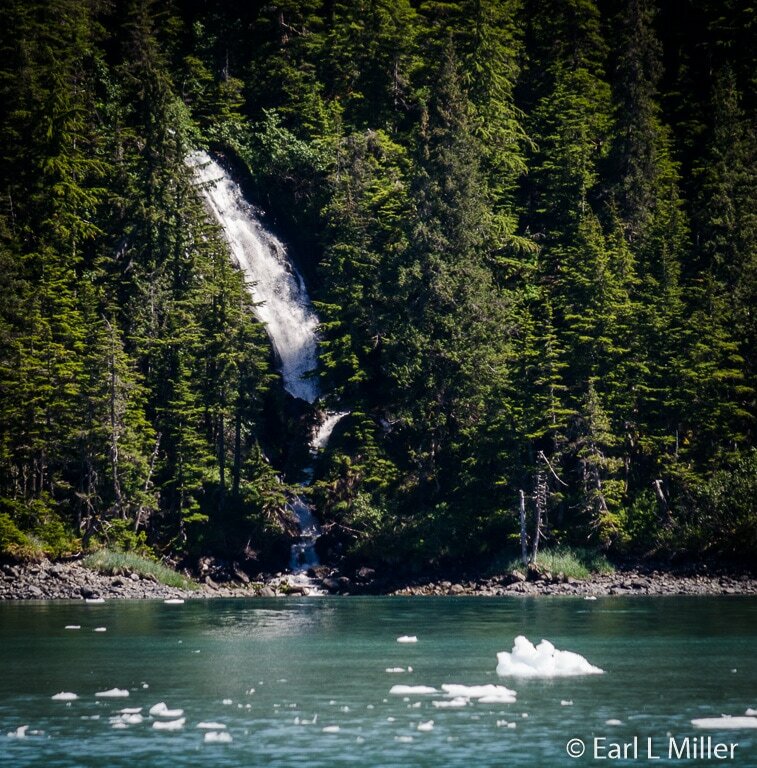 As the Valdez Spirit continued through Valdez Narrows, our boat was surrounded by steep peaks that spilled to the sea, covered with immense tidewater glaciers and thick foliage. The sea water was bluish in color due to the salt laden rivers that feed it. Greenery was in abundance. Perhaps, that is because the area gets 60 inches of rain and more than 300 inches of snow. 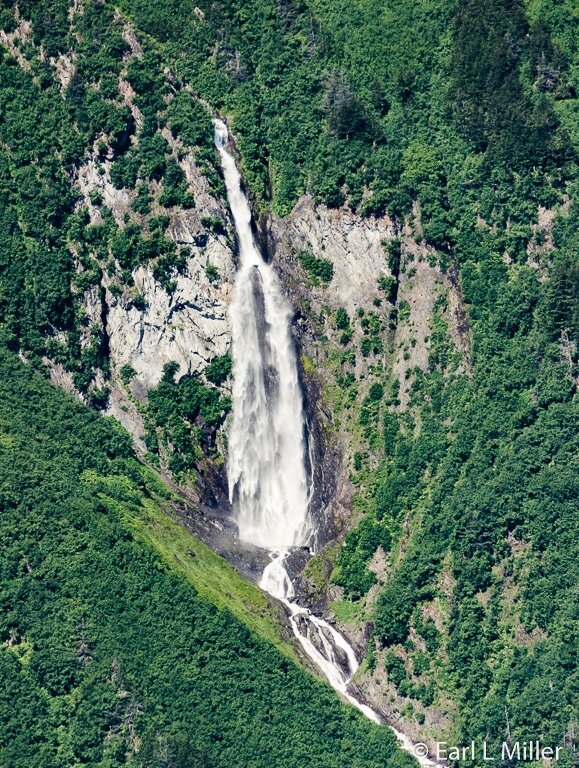 Roughly the size of New Hampshire, the Chugach National Forest, at 5.4 million acres, is the nation’s second largest. It’s also the most northerly national forest. The Sound itself is populated with many islands and fjords, several of which also contain tidewater glaciers. The Chugach offers a variety of fishing opportunities for commercial fishermen and individuals as well. Anglers cast for rainbow, lake, and cutthroat trout; Dolly Varden; and all five species of Pacific salmon. Five salmon hatcheries exist in the sound. During the first week of July, 18 million salmon return to their home. At that time, boat traffic becomes very busy. For those who wish to pursue this recreation, it’s important to obtain a sport fishing license. A King Salmon stamp is required to fish for king salmon. Licenses and stamps can be purchased at most grocery stores and tackle shops. 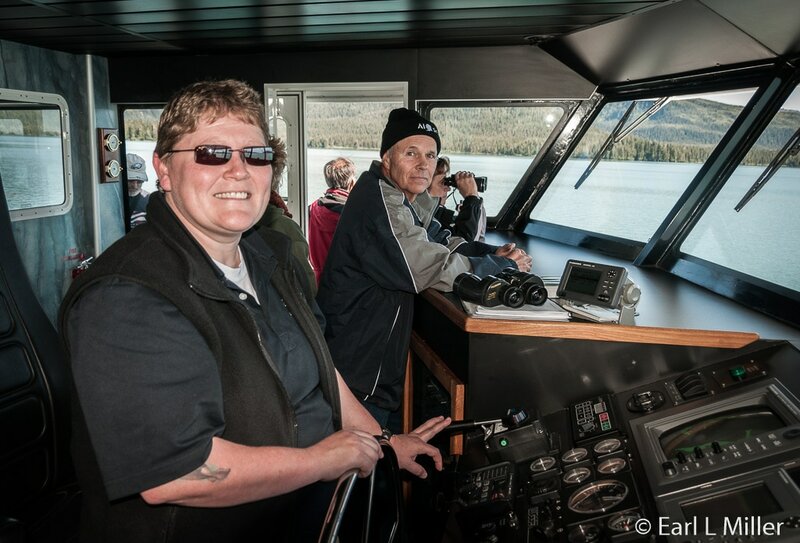 Amanda slowed down and pulled the Valdez Spirit close to Entrance Island to look for wildlife. The island is a rock formation where Sitka spruce and alder trees actually grow out of the rocks right at the shoreline. A bald eagle flew near the left side of our boat. Amanda noted immediately it was an adult since it had a white head. Juveniles are brown and don’t have this marking. She told us that eagles mate for life. Near this location, passengers also viewed marked shrimp pots. Fishing regulations allow four pots a day from April to September. Spot and sidestripe shrimp are the main species caught in recreational pots while northern shrimp are usually captured by commercial shrimp pots. We passed a waterfall on our right. Then came another which had Anderson Glacier sitting on top. Continuing on, our boat soon passed within 11 miles of Bligh Reef, the location of the Exxon Valdez spill in 1989. This wasn’t the first or the last ship to run afoul of this reef. In 1910, Alaska Steamship Company’s Olympia ran aground. On December 24, 2009, the tug Pathfinder also ran aground rupturing its tanks and spilling diesel fuel. That was despite federal code regulations mandating, since the Exxon Valdez accident, the operation of an automated navigation light to prevent future collisions with the reef. Another ruling since the Exxon Valdez is that pilots are required to be on tankers through this area. Bligh Reef was named after William Bligh of HMS Bounty fame. It’s now a fishing ground for halibut and a harvesting area for shrimp. As the Valdez Spirit passed out of the Valdez Narrows into the Valdez Arm, we passed a radar station which keeps an eye on all the boats. This is another precaution for maritime safety. Amanda spotted a Dall’s porpoise, but we didn’t get close to this one. Soon a larger group was seen straight ahead. She advised that some Dalls like to play along the boat’s bow or stern. Unfortunately, these weren’t interested. Dall’s porpoises are found only in the North Pacific. Their main body is black with white marking on their flank and belly. The upper part of their dorsal fin has a white to light grey “frosting.” Their diet consists primarily of small fishes of numerous species such as herrings, anchovies, and mackerels which they consume at a rate of about 28 to 30 pounds each day. Killer whales and white sharks are their predators. Dall porpoises are deep divers having been recorded to dive to more than a thousand feet. They’re very active, often zigzagging around at great speed or just below the water surface to create a “rooster tail” spray. They can swim up to 34 miles an hour, almost as fast as the killer whale. They weren’t the only marine mammals we saw. 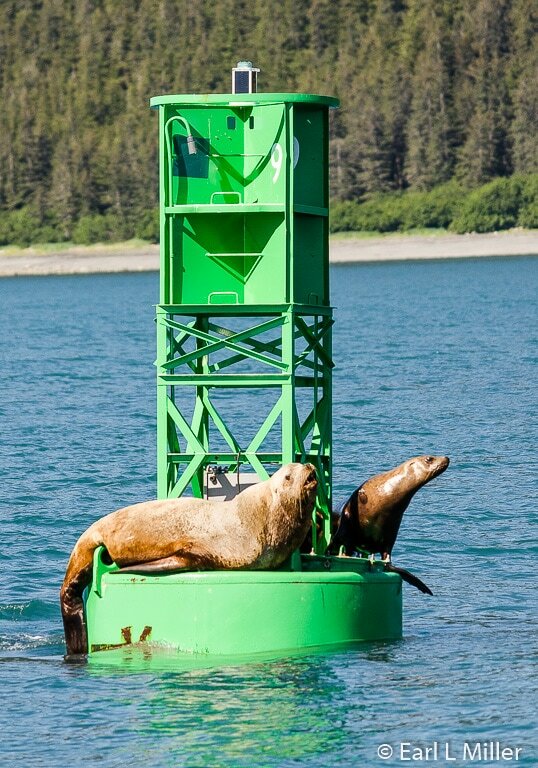 On a green buoy, four Steller sea lions hauled out. We learned these animals need to be on buoys or rocks to rest. They are found in coastal waters of the North Pacific Ocean from Japan to central California. They’re very territorial and can be aggressive. Among pinnipeds, only the walrus and two elephant seals are larger. Steller sea lions are skilled predators, feeding on a wide range of fish, invertebrates, and occasionally other pinnipeds. Their favorites are the school fish though sometimes they feed on brackish water fish such as sturgeons. Known predators are killer whales (orcas) and white sharks. These marine animals have been divided into Eastern and Western Steller sea lions. The Western Steller sea lions number has declined so much in recent years that they are now a near threatened species. Numerous causes have been suspected. One was the overfishing in Alaska waters of their fish stocks. Another was increased predation of them by orcas and sharks. 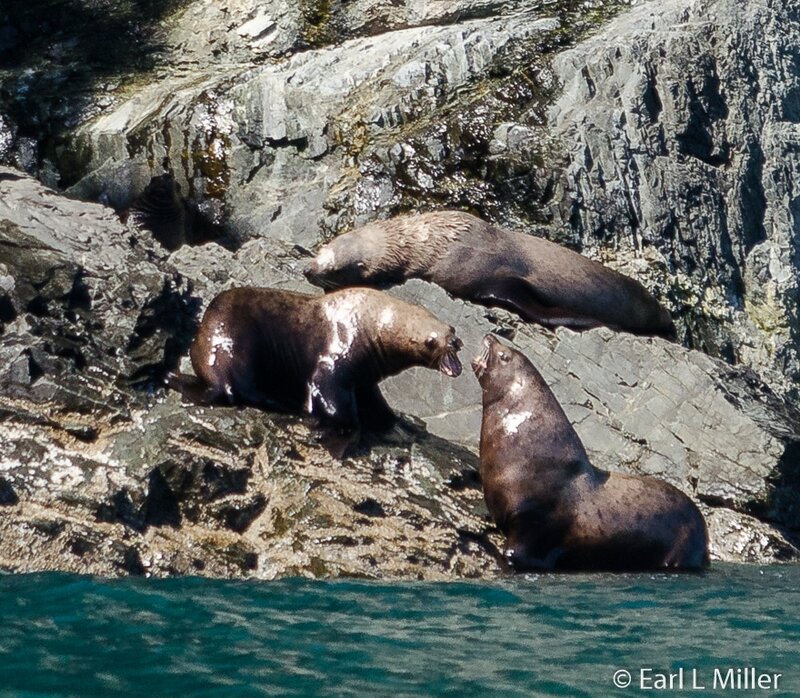 Eastern Steller sea lions are doing well. At the end of Valdez Arm, our ship passed ice floating away from the Columbia Glacier, a large tidewater glacier, located 27 miles to our left. The Columbia snakes its way 32 miles through the Chugach Mountains before dropping into Columbia Bay. It covers an area of 400 square miles and is more than 1,600 feet thick at some points. It’s the second largest glacier in the Sound with only the Hubbard being bigger. Unfortunately since 1982, it has suffered a catastrophic retreat of more than 12 miles. The retreat has been accompanied by substantial thinning. 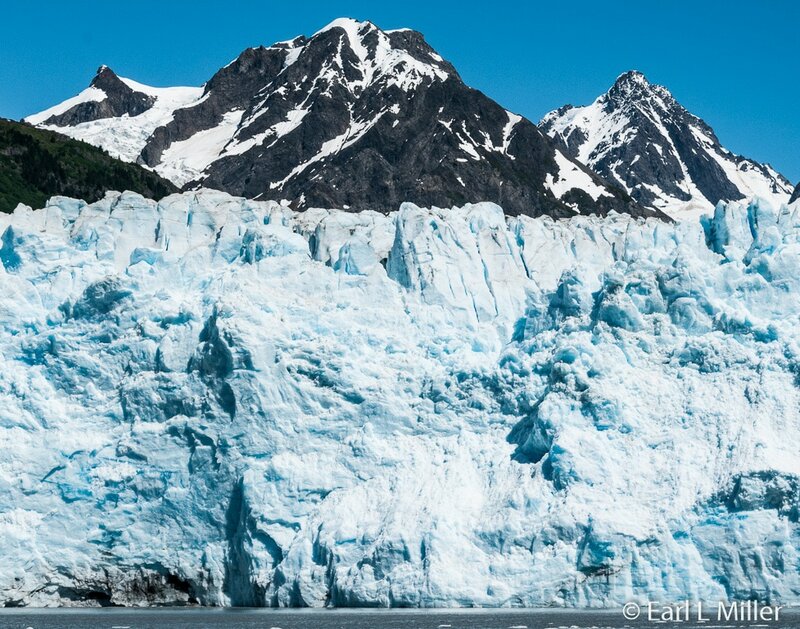 The glacier has lost about half of its total thickness and volume since the 1980's. Rings of freshly exposed rock, known as trimlines, have become prominent around the inlet throughout the 2000s. Eight to 10 tons of ice calve (fall off) the glacier daily. 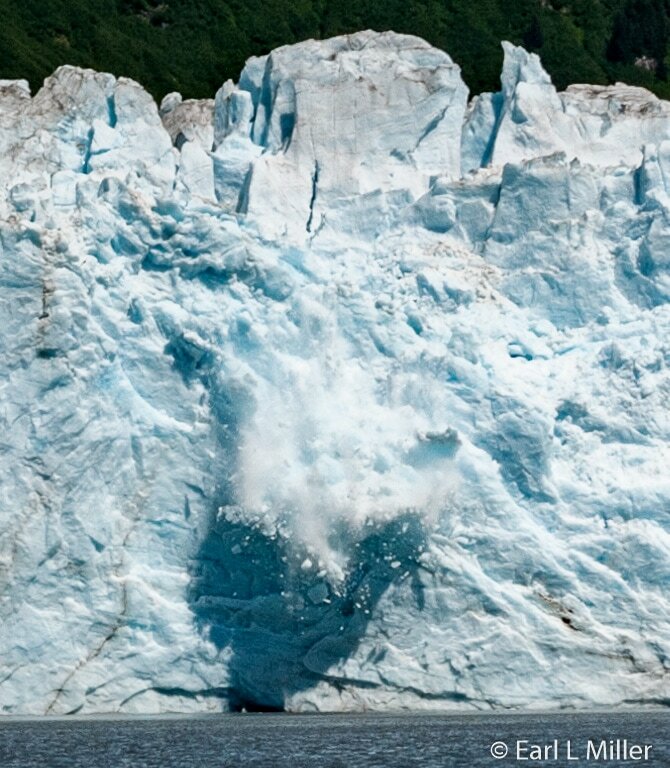 This is a phenomenon expected to stop by 2020 when the glacier reaches a stable position at 26 miles long. As we progressed, we continued to see free floating ice from the Columbia. Amanda advised us that the ice crumbles and breaks apart due to winds, tides, and currents. We also spotted the trimlines. As the boat progressed toward the Meares Glacier, passing Fairmont Island, Amanda spoke about the people who had lived in the Sound. They had canneries and were fishermen. On Fairmont Island, they had fox farms. This made it easier to capture these animals since they had no place to run. Fox farming lasted a couple of decades until World War I when the land became a national forest. At that time, they weren’t allowed to live there anymore. When the boat was around 16 miles from Meares Glacier, Amanda guided the Valdez Spirit to cruising closer to the tree-covered islands. On one of these islands, we passed Cannery Creek Hatchery which is known for pink salmon. It’s located on the eastern shore of Unakwik Inlet in the northern area of the Sound. The hatchery releases 180 million fry a year. The five Sound hatcheries have a combined release of a billion salmon, of varying types, each year. 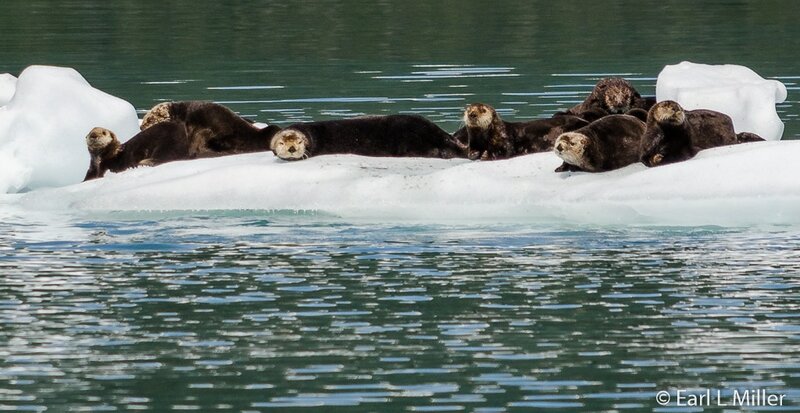 As we grew closer to the Meares Glacier, we eyed several rafts (groups) of sea otters lying on ice. Several were swimming in the water including a mom and her pup. Between 1742 and 1911, otters were almost hunted to extinction because of their exquisite pelts. They have the thickest fur in the animal kingdom with almost 100,000 hairs per square inch. An otter pelt contains between 800 million and one billion individual hairs. Unlike other marine animals, they have no blubber for insulation. They rely on a rich seafood diet, their high metabolism, and constantly refreshing the air bubbles in their fur for warmth. They’re one of the few mammals, besides primates, who use tools. They have been seen using rocks to break open shellfish while feeding. Closer in, groups of harbor seals and Steller sea lions lying on the ice were like a welcoming committee. They were on several ice floes - just hanging out. Pacific harbor seals are identified by their spotted coat in a variety of shades from white to silver-gray to black or dark brown. They’re excellent swimmers who use their hind flippers to propel and their fore flippers as rudders. They spend half of their time on land and half in water. Although they can dive to 1,500 feet for up to 40 minutes, an average dive lasts between three to seven minutes and is usually shallow. Sometimes they sleep in the water. Even at one quarter of a mile from Meares Glacier, passengers could see its huge crevasses which are a half mile wide. Passengers only see part of the glacier since it has 200 to 300 feet of ice above the water line and 400 to 500 feet of ice below. Its length travels 13 miles back into the fiord. We stayed and watched the glacier for an hour, never quite knowing where or when it would calve next. I spotted seven calvings while Earl noted more. To add to the thrill, lots of Black-legged kittiwakes and one bald eagle flew around the area. Kittiwakes are one of the most numerous of seabirds. These gulls have a white head and body, grey backs, grey wings, black legs, and a yellow bill. At times, their legs are pink-grey to reddish which causes confusion with Red-legged kittiwakes. They range from the North Pacific to the North Atlantic and Arctic Oceans. Kittiwakes are the only gull species that are exclusively cliff-nesting. Although it was difficult to leave this scene, we finally headed back to Valdez. Amanda kept a close watch on the forest we passed. She suddenly stopped the boat so passengers could watch a Sitka Black-tailed deer with her fawn. These deer are a subspecies of a mule deer and are smaller. On our return, she briefed passengers about the 1964 earthquake that had destroyed Old Town Valdez. It had a massive effect on the landscape. It caused some areas, such as one nearby island to rise 32 feet while other locations such as Whittier fell six to eight feet. At 3:30 p.m., we came out of the inlet. A humpback whale decided to travel alongside our boat for awhile. There were cheers on board when he did several dives as well as a peduncle slap (slap of their tail). He seemed to be having as much fun as the passengers did watching him. These giants that average 40-60 feet long can be seen from a distance. Their huge flippers can sometimes reach 30% of their entire length. They have two blowholes. They’re baleen whales that feed on a variety of small ocean life. Humpbacks migrate to Hawaii and Mexico to mate and give birth to their young before returning to Alaska's waters where they hunt and feed. While in the warm waters, they live off of their blubber. Male humpbacks are known for their whale songs. They can make sounds which can be heard from many miles away and often go on for hours. Sometimes whales, miles apart in distance, can be heard creating the same sounds together in unison. They will sometimes change their songs to harmonize with other whales. The boat stopped next at Point Bull Head, an island with several rookeries where we saw thousands of horned and tufted puffins nesting and flying around. 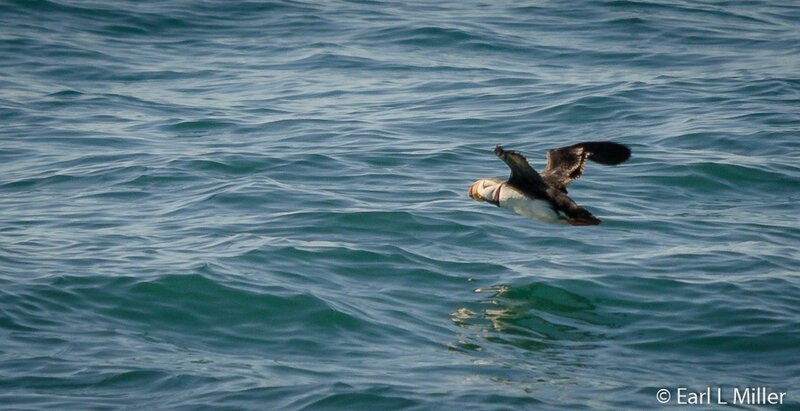 Horned puffins have an orange beak and are black and white while tufted puffins are all black. Between June and August, these birds return to nest and have young. Otherwise, they stay over open water. 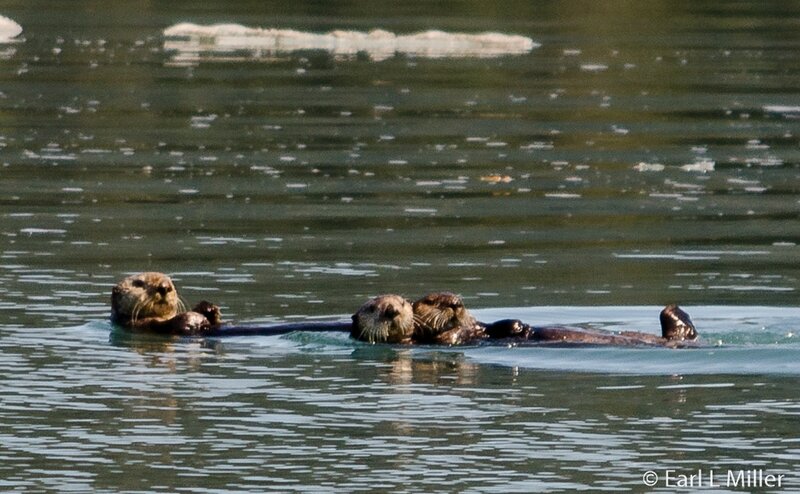 At the Head, we saw more sea otters and colonies of sea lions. Pigeon Guillemots wandered amongst these marine mammals. When our journey came close to Bligh Reef again, Amanda related the story of the Exxon Valdez spill. She related the accident’s cause, how it was responded to, and its after effects in regards to wildlife. (For the full story, go to my March 4 article on this web site). 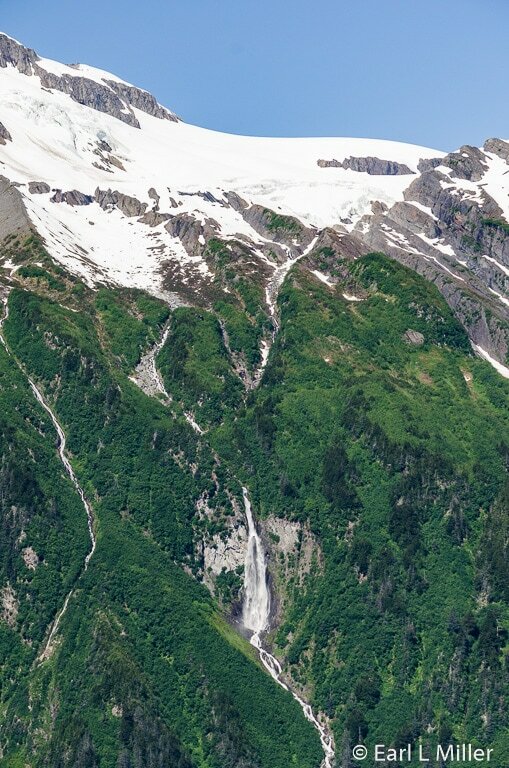 After arriving at Valdez Arm, we again passed the Anderson Glacier with its waterfall. At that point, Amanda advised us about current life in Valdez. An economy of oil, fishing and tourism supports the town’s population of 4,000. In January, skiing and snowboarding are popular while during the summer the emphasis is on boating, kayaking, and fishing. At 6:50 p.m., the Valdez Spirit docked with a boatload of tired but very contented passengers. We felt it was a day well spent and highly recommend taking this cruise if you are ever in Valdez. For further information or to book a cruise, go to Stan Stephens Cruises web site.